New York, Pace Wildenstein Gallery, Georg Baselitz: Recent Paintings, March-April 2000, p. 17 (illustrated). 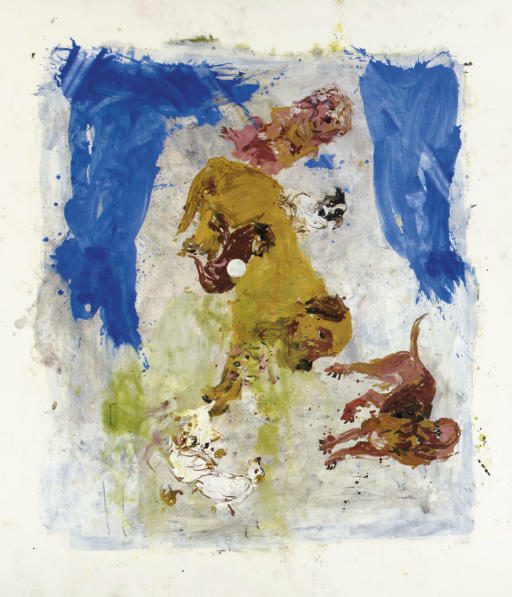 The dog (or Hund) first appeared in Baselitz's work in the fracture paintings of the mid-1960s were pictured loyally at the side of hunters and axe-men. Portraits, landscapes (and dogs) are turned upside down in 1969. "By inverting the subject, Baselitz forces a nonliteral and nonillustionistic reading of the painting. 'The reality is the picture' [Baseltiz] says, 'it is most certainly not in the picture'. Baselitz means to give us such disruptive, disturbing works-images which generate pandemonium. His famous upside-down figures, disrupting the rigid expectations of ordinary petrified perception, are insubordinate Baselitz's images are impulsive in a way disturbing to the opinionated mind, for they evoke the alienness of the unconsciousness as such as well as of repressed feelings for the particular objects" (D. Kuspit, 1986 as quoted in T. Krens et al, Refigured Painting: The German Image 1960-88, New York, 1989, p. 255). Statement, painted in lush blues and yellows, places the subject sideways or as if in motion. Baselitz continues then to challenge our perception of the picture plane and our presumed visual reality.